Pavel created a short demo video of Seaside XUL using Pharo. XUL is the user interface markup language that Firefox and applications based on XULRunner use for the user interface. As I already reported there are also old screenshots available. One can buy the Smalltalker's T-shirt inspired by a blog post now from a T-shirt shop. Nice. Beside the Podcasts on VisualWorks (via James) there are also podcasts/videos from Marten on VisualAge available. Michael announced a Pharo port of "Rome" - a Cairo-backed graphics system. Read more. Hernán announced a new browser for the Magma OO-database. He also created a demo video which is available on youtube. Explorer SDK. 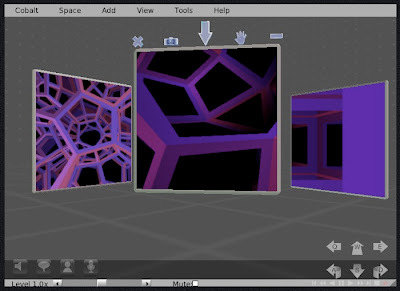 It is based on Croquet and allows you to explore the structure of curved spaces in 3D. Gofer is a small tool on top of Monticello that loads, updates, merges, diffs, reverts, commits, recompiles and unloads groups of Monticello packages. If you work with Pharo or Gemstone you may already know it. Interesting that in the newest version you get git like behavior where you can pull published packages into the local cache. If you work offline you can later push your changes easily back into the repository. Read more here. You want to use Pharo core images to develop iPhone applications? So beside iSqueak have a look at Mars/Deimos. Continuous Integration is discussed on the Pharo list. One possible solution is to use Mason. You can download it here and read a short overview here. and execute arbitrary scripts, etc." James Foster provides some introduction videos on Gemstone and Smalltalk.